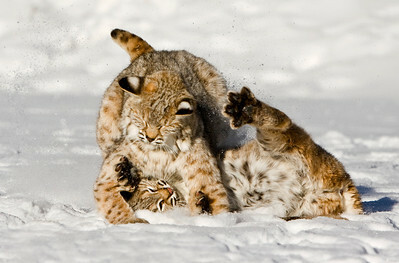 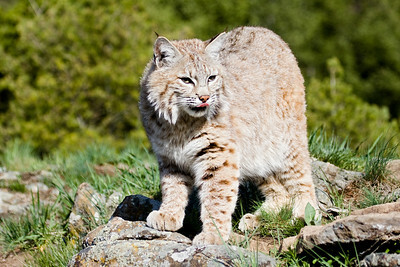 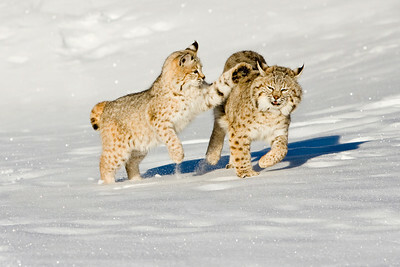 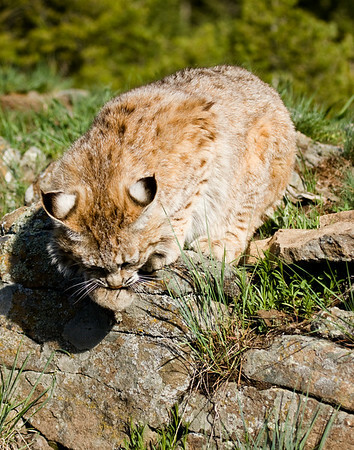 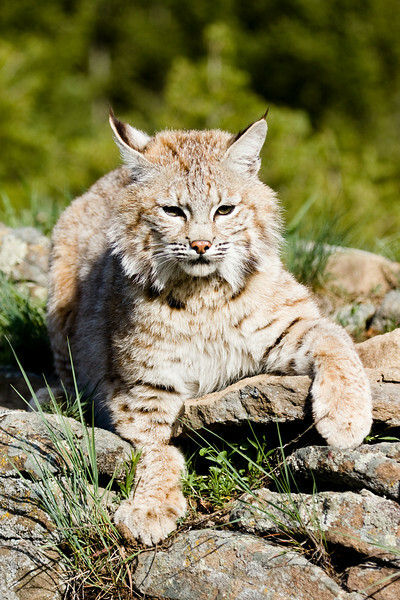 The large paws give this lynx away! 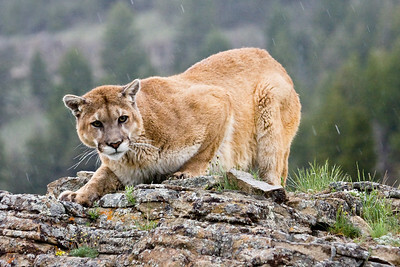 It was certainly curious about who was watching. 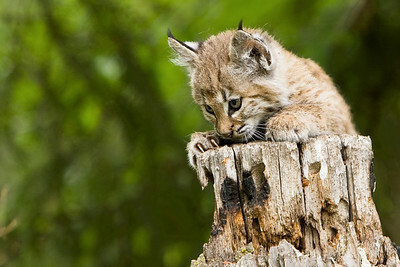 A bobcat kitten crawls around, exploring outside this hollow tree stump. 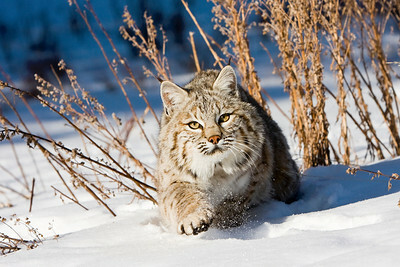 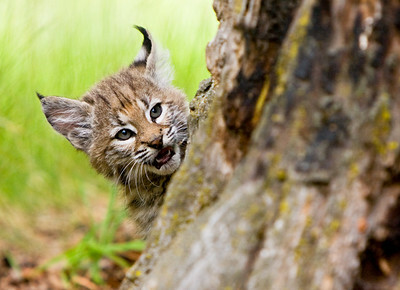 This bobcat has just seen something.... dinner time!! 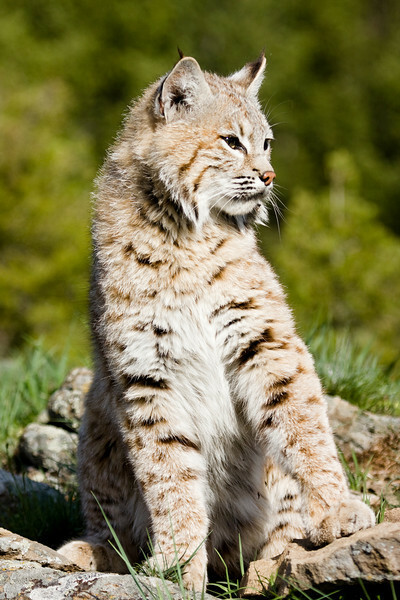 This bobcat had been sunning itself, but something got it's attention. 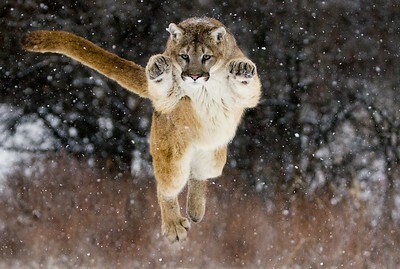 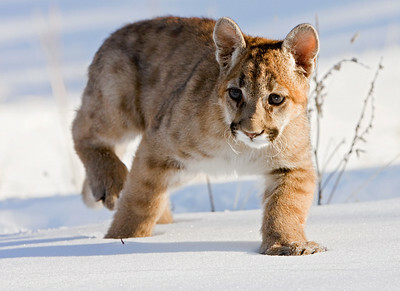 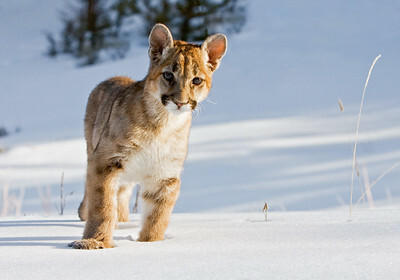 The young cougar sees something interesting in the snow. 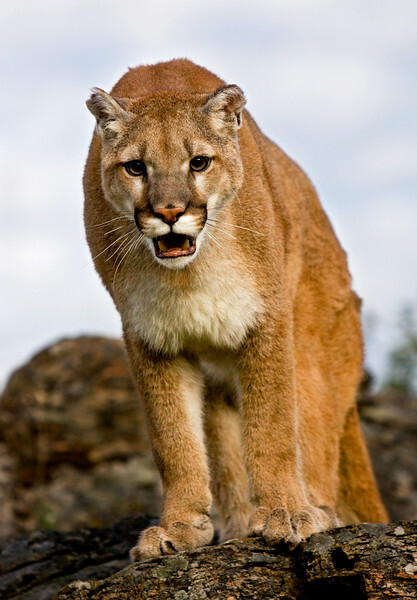 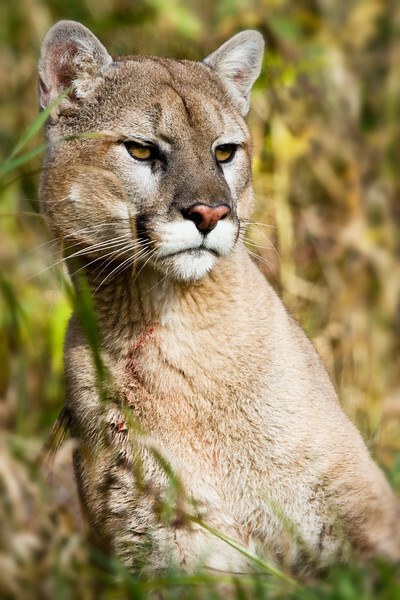 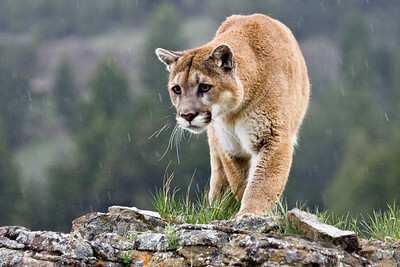 Something (or someone) has caught the attention of this cougar - also known as mountain lion or puma. 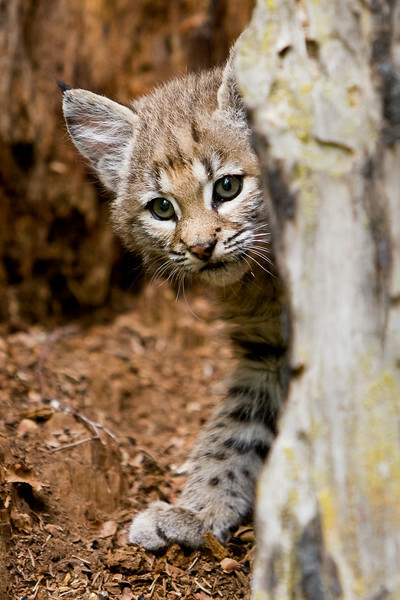 A very young bobcat kitten peers out from inside a hollow tree stump. 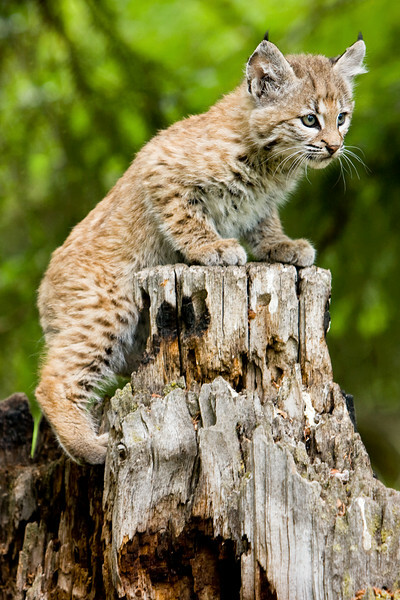 This young bobcat kitten has been captivated by something! 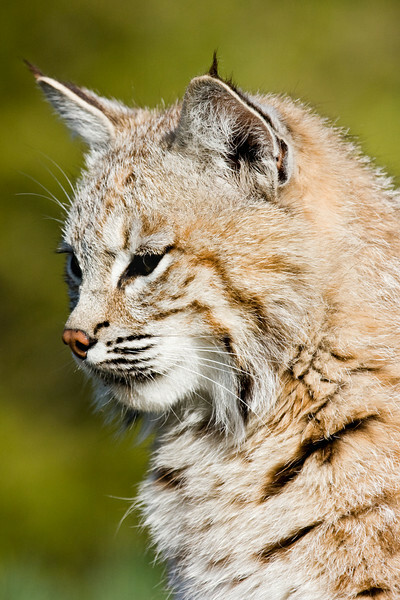 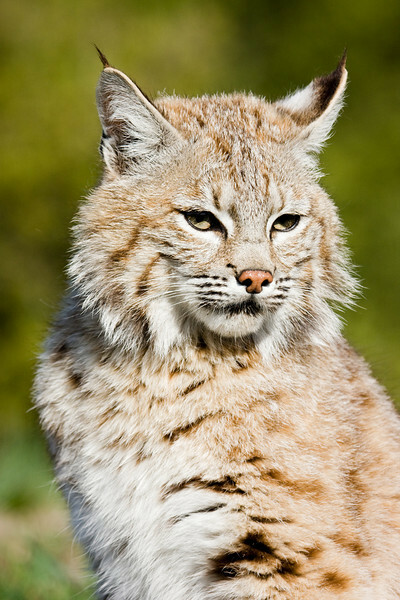 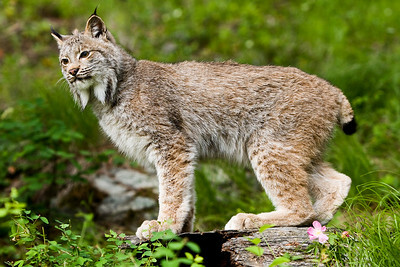 Proud and handsome bobcat, showing the typical white mark on the back of their ears. 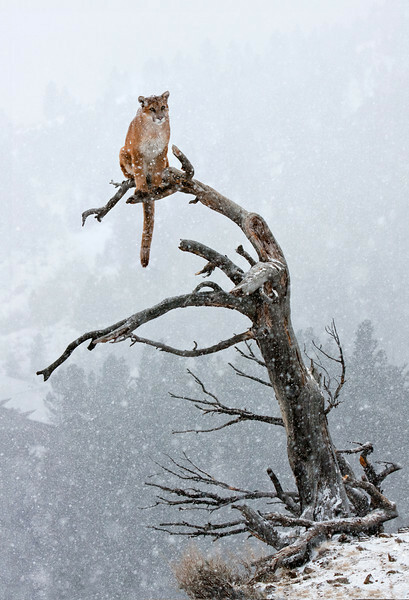 Maybe a photographer for breakfast? 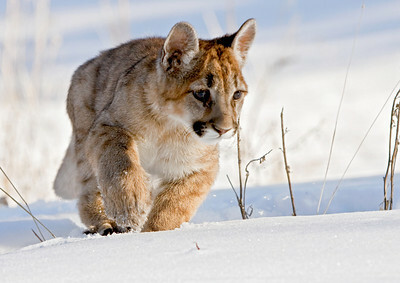 Enjoying his first winter, this young cougar is simply looking for ways to cause trouble!! 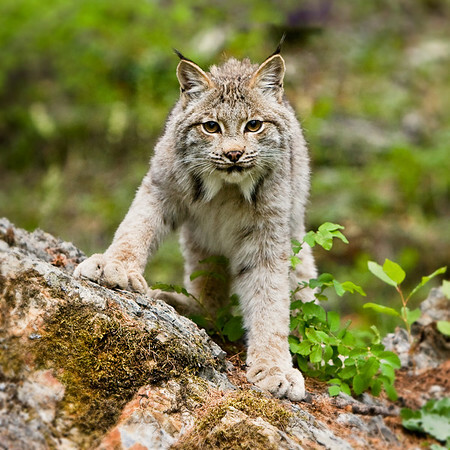 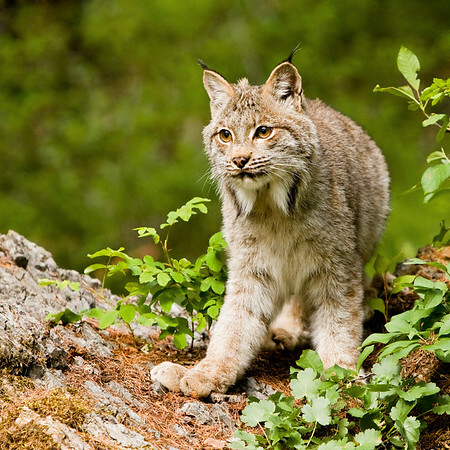 A very attentive Canada lynx. 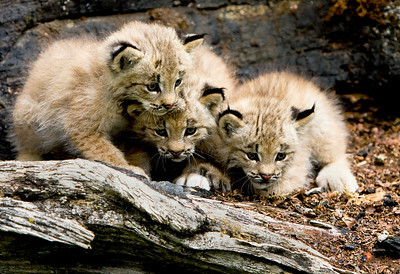 These three Canada Lynx kittens are completely captivated by a tiny ladybug! 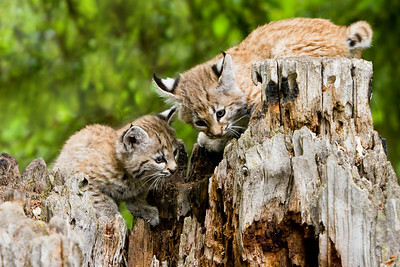 This pair of curious bobcat kittens seem to have found something on a rotting tree stump. 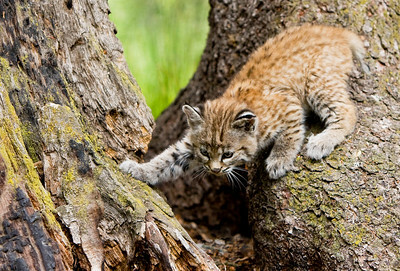 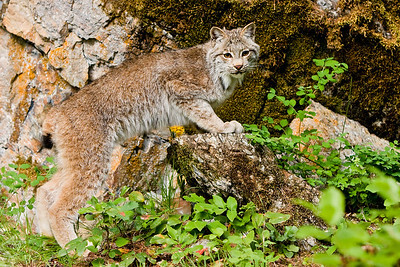 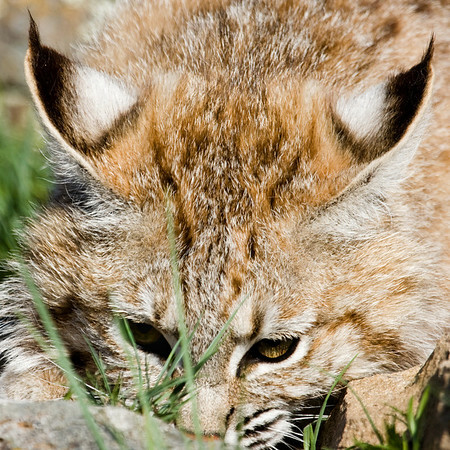 Young bobcat kitten about to ambush some mock-prey (one of it's siblings in fact). 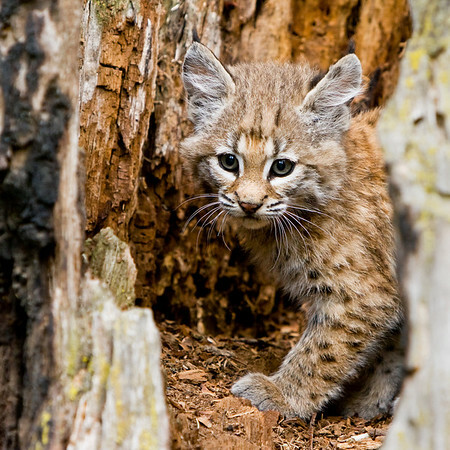 A curious looking bobcat kitten peers out from inside a hollow tree stump. 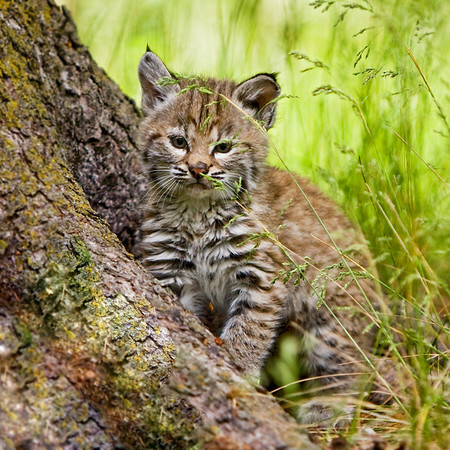 This little bobcat kitten is sizing up it's sibling, who is about to get ambushed! 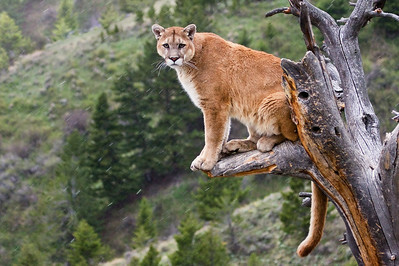 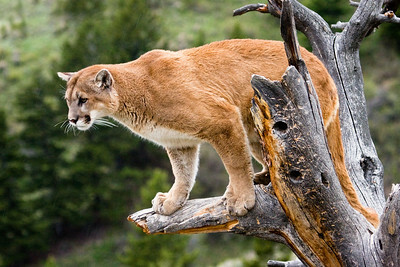 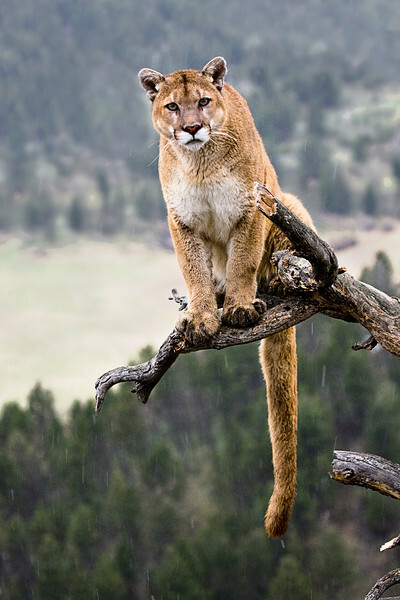 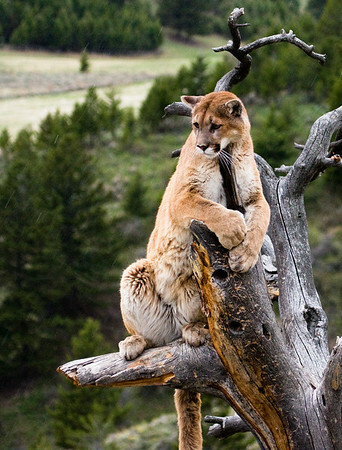 Cougars will often wait in a tree to ambush passing prey. 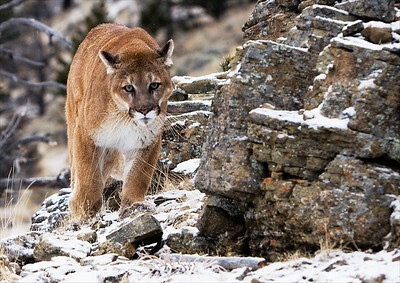 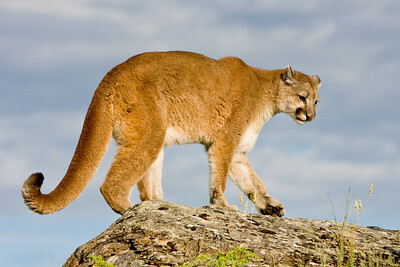 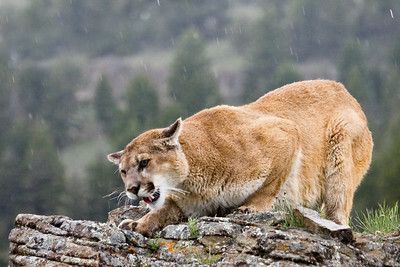 This cougar - also known as mountain lion or puma - takes an early morning walk along a rocky ridge.